Apple has explored building different kids of styluses compatible with the iPhone and iPad, including an optical stylus, and a handheld pointer with haptic feedback. Apple's interest was detailed in a pair of patent applications published this week and discovered by AppleInsider. The first, entitled Haptic Input Device, shows a pen that could receive input from a touch-based device like an iPhone, while the second, Optical Stylus, would feature a camera pressure sensor for more precise control. 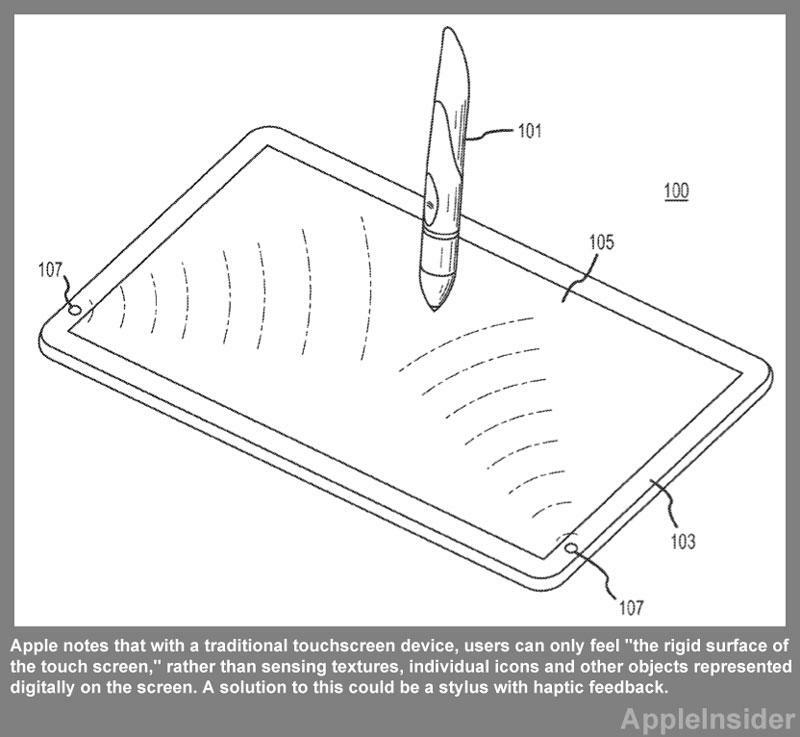 In the haptic stylus filing, Apple notes that with a traditional touchscreen device, users can only feel "the rigid surface of the touch screen," rather than sensing textures, individual icons and other objects represented digitally on the screen. A solution to this could be a stylus with haptic feedback. "An input device capable of generating haptic feedback may help a user navigate content displayed on the screen, and may further serve to enhance the content of various applications by creating a more appealing and realistic user interface," the filing reads, noting that haptic feedback could be provided with any force, vibration or motion that could be sensed by the user. Apple has shown considerable interest in haptic feedback with iOS devices in recent patent applications published by the U.S. Patent and Trademark Office. One filing unveiled earlier this week described a system that would allow users to feel textures with their fingertips, while another filing from March presented a concept that would use actuators to provide haptic feedback, and also measure the force with which a user touches an iPhone or iPad screen. Apple's second patent filing discovered this week for an optical stylus notes that traditional, plastic styluses cannot be used to register input on a capacitive touchscreen like is found on the iPhone or iPad. In addition, styluses offer a point smaller than a finger tip, which can give users more precise control. 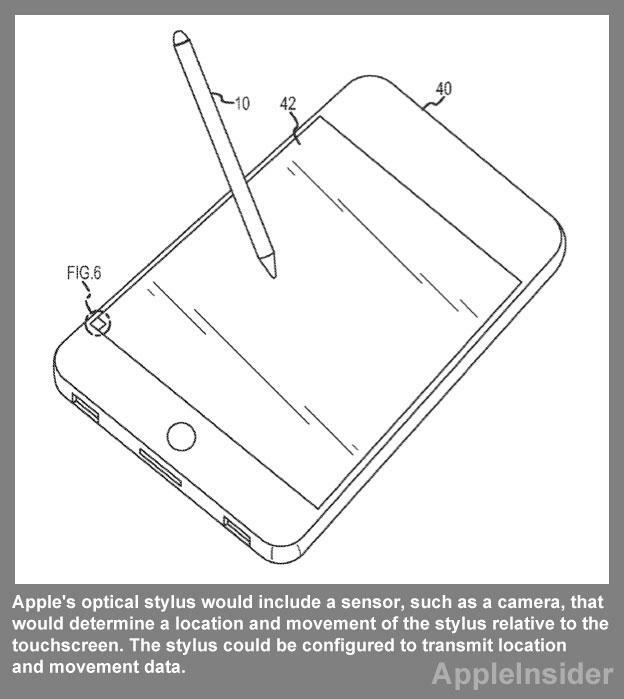 Apple's optical stylus would include a sensor, such as a camera, that would determine a location and movement of the stylus relative to the touchscreen. The stylus could be configured to either transmit location and movement to the computing device, or to process and filter the location and movement prior to transmission, rather than sending raw data. "The relative position of the optical stylus may be determined based on indicia detectable by the optical stylus," the filing reads. "The indicia may further be used in determining the movement of the optical stylus. The indicia may include pixel dependent indicia that are communicated via the pixels displayed by the touch screen or physical or permanent indicia that are physically present on or in the screen.... (that) are imperceptible to the human eye." Apple's patent filings have previously shown the company's behind-the-scenes takes on styluses for touchscreen devices. One concept discovered last year described concepts such as a "heated stylus" for more precise interaction. Despite continued stylus-based patent filings from Apple, the prospect of an official Apple stylus for the iPhone or iPad has been largely dismissed because of comments made by the company disparaging stylus-driven user interfaces. Late Apple co-founder Steve Jobs famously said: "If you see a stylus, they blew it." The haptic stylus filing revealed this week was first filed by Apple with the USPTO in November of 2010, and is credited to inventors Aleksandar Pance and Omar Sze Leung. The optical stylus application was also filed in November of 2010 and includes Leung as an inventor, as well as David I. Simon and David Amm.